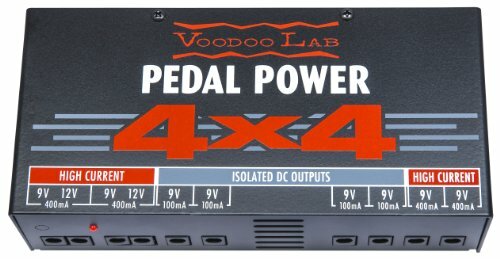 The Voodoo Lab Pedal Power 4x4 Power Supply is perfect for large pedalboards with power-hungry effects! This linear power supply can properly power up to 4 digital effects like those from Strymon, Eventide, Line 6, TC Electronic and more, plus 4 standard 9-volt battery stomp boxes! Pedal Power 4x4 features 8 completely isolated, filtered, and regulated output sections that will keep your pedals dead quiet and free from high-frequency noise that occurs with digital ‘switching’ power supplies. Voodoo Lab’s Pedal Power 4x4 features an internal thermometer that controls a silent fan keeping the unit cool even under the most adverse heat conditions of outdoor festival stages. Even with poor AC line conditions, it delivers clean, consistent power. Handmade in the USA using the finest components, the Pedal Power 4x4 power supply is designed to meet and exceed the needs of our most demanding users.